Melas Chasma is part of the Valles Marineris canyon system, the largest canyon in the Solar System. It has been recently suggested that Melas Chasma may have been produced by an impact crater. 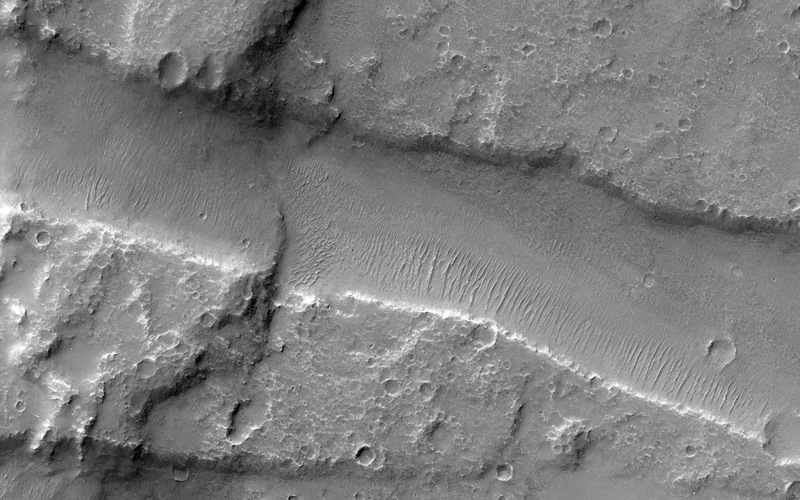 To test this idea, HiRISE has been imaging surrounding small faults such as the ones seen in this image. There are actually three faults in this image. The two trench-like features are called “graben” and are caused when the surface stretches apart and blocks of rock drop downwards. The third fault is the wavy ridge the cuts across both of the graben. This type of fault is sometimes called a “wrinkle ridge” and occurs when surface rocks are compressed causing one block of rock to be thrust up on top of another. So this area has been both stretched in the north-south direction and squeezed in the east-west direction. With enough HiRISE images scientists hope to reconstruct the full history of this area and uncover the origin of one of Mars’ most spectacular features. This is a stereo pair with ESP_034817_1645.